Good morning! Well, it's been a while since we had our CCEE challenge (2 months to be exact), but after a holiday break, the CCEE Stampers are back at it, and we're kicking off the month of January with a series of sketch challenges hosted by Cindy Haffner. Cindy has a great eye for layout design and always comes up with cool challenges. We've had a few changes to our group and schedule. I'm sad to see four of our original members leave our group: Cindy Motherway, Carolyn King, Dawn Lusk, and Deb Mills, but they haven't left the stamping community, so you'll still see them out there. On a happy note, I hope you'll visit our CCEE blog and give a warm welcome to two new members, both of whom are exceptionally talented: Joanne Grzelak and Shirley Quarry!!! Also, our challenge day has moved from Monday to Thursday of each week. I hope you'll find some time to play along with us! I used one of my favorite floral sets from Gina K. Designs, A Year of Flowers. I love the tulips in this set. I colored them with Copic markers and shaded all around my flowers to tone down the white in the cardstock. I felt that flowed better with my earthtone colors of Ruby Red and More Mustard. My next card is unrelated to our CCEE challenge. I just didn't get a chance to upload it to my blog last night. This is one I made for a friend's birthday using the sketch design from the sketch challenge on Splitcoaststampers and Stampin' Up's Flight of the Butterfly stamp set. My colors in this are Pink Pirouette and Chocolate Chip. Thanks for stopping by! I have a busy morning scheduled at work and then I'm off in the afternoon for some personal appointments, but I'll be by to visit your blog soon! You rocked the CCEE Sketch Challenge Charlene. Those hot colours in the tulip card are just what I need to see today. The contrast between the orange and red and the black layers is just fabulous. Oh wow, Charlene!! This is just so BEAUTIFUL!! Love the colors and the border punch is just perfect with this image! Your second card is adorable too...I just love thos butterflies!! WOWsers girl!! Those tulips are just STUNNING!! LOVE the colors! And your butterfly card is just as sweet as ever!! Two very fabulous creations!! Wow - two beautiful cards Charlene! I love the deep colors on the tulips and the pink butterfly one is so bright and airy! 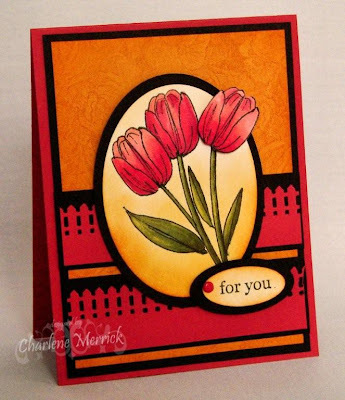 The tulip card is beautiful, Charlene! LOVE the depth of colors! And the butterfly card is absolutely adorable! OK WOWZERS Charlene, those tulips are gorgeous! Such warmth and a beautiful crisp design. And the butterflies are so sweet too! I have a few butterflies and never know what to do with them, yours look so pretty flittin around your card...makes me want to sing it is so happy!! And your tulips are gorgeous, I really love those in the earth tones and wonderful job with the CCEE!! I am so glad you all are back, and with a few new wonderful additions also!! Big hugs! Wow beautiful cards Charlene..I am always envious of your elegant style..The coloring on the first one is phenominal and the colors combo and butterflies are awesome on the second..Great job..Welcome to the two new gals..Love their work. I'm glad we don't have to choose a fav, because I would be stuck! Those tulips & colors are sooooo inviting! The soft pink butterflies are reaching to the other side, delicate and soothing! Beautiful tulips and awesome color choice. 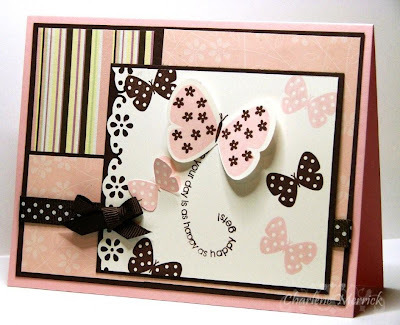 Springy butterfly card, love it.